Bluehost is an incredible hosting option if you are looking for a reliable, faster and secured hosting providers. Bluehost has various hosting types which include shared hosting, VPS Bluehost hosting and dedicated hosting services. 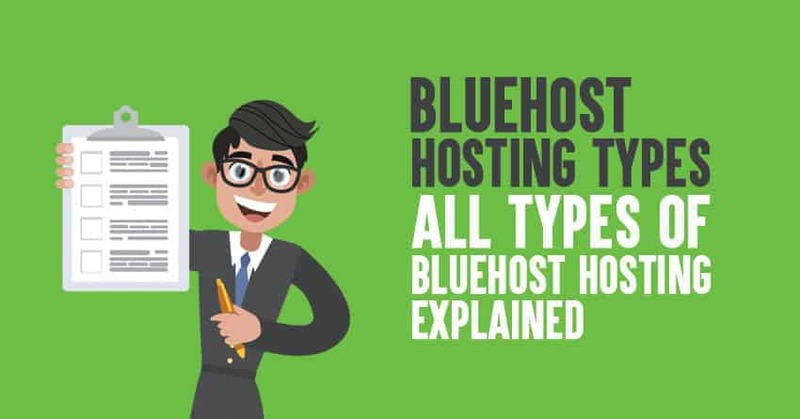 If you are confused between those three Bluehost hosting types, this page is for you which explains the major differences between them along with the features. So what are you waiting for? Let’s get into the details and find out which is the right Bluehost hosting plan for you. Bluehost shared hosting option is the cheapest option available from Bluehost hosting. But make no mistake, it’s also one of the highly reliable hosting options widely used by marketers and bloggers all over the globe. Bluehost shared hosting is perfect for bloggers and marketers who have a limited budget. Let me now explain about each of these packages in detail along with their features. Bluehost shared hosting Basic plan: This is the cheapest hosting you can get from Bluehost. It starts at just $3.49 per month and perfect option for beginners who want to launch their WordPress websites on a reliable hosting service. Here are the features you get from this plan. Bluehost shared hosting Plus plan: This is the highly recommended and widely used Bluehost shared hosting package. It costs you just $5.95 per month but allows you to install up to 10 WordPress sites at a time. Here are the features that you get from Bluehost shared hosting plus plan. Bluehost shared hosting Business Pro plan: If you are running a small business or someone who wants to host unlimited number of sites at one place without paying much, this plan is right for you. It costs you just $13.95 per month but gives you advanced features like Global CDN access, Site Backup Pro, 1 dedicated IP access etc. You can install any number of WordPress sites you want with unlimited hosting space. If you want a faster loading website without putting a lot of money, you should definitely consider Bluehost VPS hosting. VPS (Virtual Private Servers) help you boost your website loading speed and also better optimized for your website visitors. Bluehost VPS hosting has 4 pricing packages which include the following. Let’s now discuss about these 4 packages briefly along with their features. Bluehost VPS hosting Standard plan: This plan gives you over 30 GB storage but also provides you 2 CPU cores which helps you boost your overall website loading times really faster. You will also get a 1 Terabyte of bandwidth with this VPS basic pricing plan. Bluehost VPS hosting Enhanced plan: This plan gives you over 60 GB storage but also provides you 2 CPU cores and offers you 4 GB of RAM which helps you boost your overall website loading times really faster. Bluehost VPS hosting Premium plan: This plan gives you over 120 GB storage but also provides you 3 CPU cores and 6 GB RAM which helps you boost your overall website loading times really faster. Bluehost VPS hosting Ultimate plan: This plan gives you over 240 GB storage but also provides you 4 CPU cores and 8 GB RAM which helps you boost your overall website loading times really faster. Quick Note: Click here for a detailed review of Bluehost VPS hosting and to know its features. If you want a powerful hosting service that not only runs really faster but also gives you advanced security, Bluehost dedicated hosting is perfect for you. This hosting is perfect all the small businesses and medium sized business owners who are looking to give better experience to their website users. Now, let’s talk about the above 3 pricing packages along with the features they offer. Bluehost dedicated hosting Standard plan: This plan gives you 1 TB storage, 4 GB RAM, 5 TB bandwidth, 3 IP addresses with the speed of 4 x 2.5 GHz CPU. This configuration will make it easy for you to easily run even a high traffic website. Bluehost dedicated hosting Enhanced plan: This plan gives you 1 TB storage, 8 GB RAM, 10 TB bandwidth, 4 IP addresses with the speed of 4 x 2.5 GHz CPU. This will make it easy for you to run your WordPress sites really faster. Bluehost dedicated hosting Premium plan: This plan gives you 1 TB storage, 16 GB RAM, 15 TB bandwidth, 5 IP addresses with the speed of 4 x 2.5 GHz CPU. With this configuration, even a high traffic blog can run really faster, better and smoother. If you’re looking for faster, cheaper and safer hosting environment, give a try to cloud hosting from Bluehost. In simple terms, cloud hosting is virtual in nature and is established on a group of servers that share common resources so as to gather some requirements for its customers. Generally cloud hosting is way faster than shared hosting environment and prices of both of them are almost similar. As you can see from the above image, you’ll notice that websites that are hosted on Bluehost cloud hosting environment run much faster than the sites hosted on Bluehost shared hosting environment. Bluehost offers the following pricing packages in their cloud hosting. Performance: This is popular cloud hosting plan which costs you $8.95 per month and you’ll get access to the following things. Business pro: This is the ultimate hosting plan from Bluehost cloud hosting which costs you $15.95 per month and you’ll get access to the following things. If you’re a WordPress user and looking for the best hosting, go for Bluehost optimized WordPress hosting as it gives you stunning features like auto updates, backups, security features and so on. Not only that, it gives you amazing website performance. Just have a look a the the Bluehost load impact. If you see the above screenshot, you will notice that the blue line is the number of active virtual users on the Bluehost server and the green line is the server load time. You’ll notice from the above image that the server load remained stable throughout the test even at peak traffic. Bluehost offers the following pricing packages in their optimized WordPress hosting. WP enhanced: This plan costs you $29.99 per month which can handle up to 300 million visits per month where you’ll get 60 GB of storage space, 60 GB of backups along with 4 GB RAM and free SSL certificate. WP premium: This plan costs you $39.99 per month which can handle up to 600 million visits per month where you’ll get 120 GB of storage space, 120 GB of backups along with 6 GB RAM and free SSL certificate. If you want to set up your eCommerce store online, you should pick WooCommerce hosting and Bluehost is one of the few hosting services that offers hosting services with incredible features. The best part about using Bluehost WooCommerce hosting is that it gives you pre-installs of WordPress, WooCommerce, Storefront theme and dedicated IP and SSL to get you up and running fast. Not to mention that you will also get access to Bluehost 24/7 support by in-house WordPress experts. Bluehost offers the following pricing packages in their WooCommerce hosting. Starter plan starts at $6.95 per month and it is the best option for beginners who want to get access to WooCommerce hosting from Bluehost and you’ll get the following features. Plus plan is the widely used WooCommerce hosting from Bluehost which costs you $8.95 per month and gives you access to the following things. Pro plan is the advanced WooCommerce hosting plan from Bluehost which costs you $12.95 per month and you’ll get access to the following features. I know picking the right hosing service is really a hard choice. There are over 150 web hosting companies out there offering free to most expensive web hosting types. Among all of them, Bluehost definitely stands out as it is in the business for over a decade now and over 2 million domains are being hosted on it which makes it reliable. So what is your choice? Which hosting option are you going to choose from 3 Bluehost hosting types?